"GO-FAIR" is a proposal for the practical implementation of the European Open Science Cloud (EOSC) through a federated approach making optimal use of existing initiatives and infrastructures in the participating Member States. 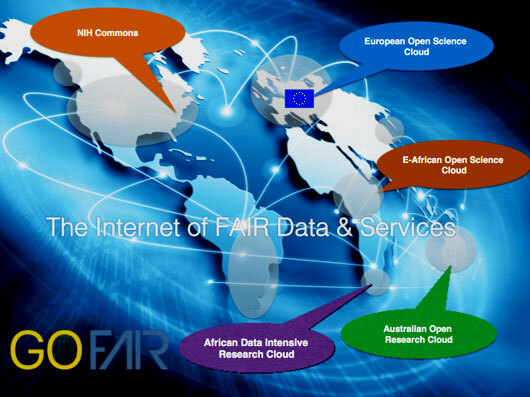 “GO-FAIR” is a proposal for the practical implementation of the European Open Science Cloud (EOSC) through a federated approach making optimal use of existing initiatives and infrastructures in the participating Member States. The European Commission (EC) launched the INFRADEV-04-2016 Call entitled European Open Science Cloud for Research on April 15 during the European Open Science Cloud Info Day and now a consortium is starting with the work to build up the core elements of the EOSC. But, as the EOSC is more about federating and interconnecting existing research infrastructure and only providing new layers for disciplines without a sufficient infrastructure, proposals are needed how to optimally connect the existing research infrastructure. The EOSC Workshop with Member States representatives of June 29, 2016 clearly identified the need for additional, subsidiary activity and mandate at the EU level, in order both to prevent further fragmentation and to initiate active defragmentation of existing assets and activities in Member States, as well as at the level of policy influence, formulating rules of engagement, accreditation, protocols and standards. 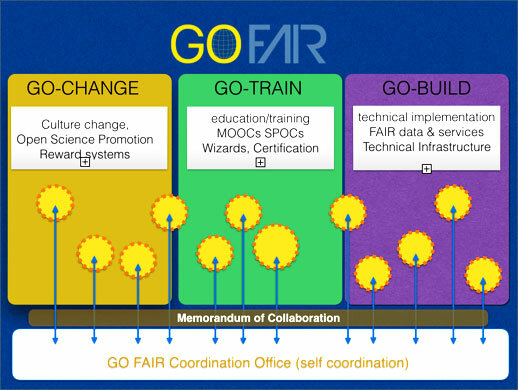 “GO-FAIR” is the working title of a proposal prepared by a group of “early mover” Member States for the completely inclusive, open and practical implementation of the recommendations of the EOSC High Level Expert Group (HLEG) and the commitments made in the EOSC Communication, through a federated approach making optimal use of existing initiatives and infrastructures in the participating Member States. The Netherlands has taken the initiative in follow up of its EU presidency in 2016 and the Amsterdam Call for Action on Open Science to initiate and co-lead the discussions and the early development of the GO-FAIR initiative, overseen by a national task force. Professor Barend Mons, former chair of the HLEG, will lead the preparatory phase of GO-FAIR, with a growing group of representatives from other countries. The three pillars GO-CHANGE, GO-TRAIN, and GO-BUILD are interconnected in various ways. It is clear from the report of the HLEG that cultural change is fundamental to success. Without this, there is no foundation to sustain the necessary training of the data stewards in the education pillar and, without both these essentials for a paradigm shift establishing a new Open Science culture, any technology built will not be used sufficiently. The first meeting of the G7 Open Science Working Group in Tokyo emphasized that it is crucial to promote and implement cultural change in order to make the FAIR-principles a working standard in science and to reform reward systems in a way that evaluation of research careers fully acknowledges Open Science activities. This is exactly the goal of the GO-CHANGE pillar in the GO-FAIR approach. GO-TRAIN is about a substantial training initiative in Europe so as to locate, create, maintain, and sustain the required core data expertise. The aim of this training and education is to have core certified data experts and to have in each Member State and for each discipline at least one certified institute to support implementation of Data Stewardship per discipline. GO-BUILD deals with the need of interoperable and federated data infrastructures and the harmonization of standards, protocols, and services, which enable all researchers to deposit access and analyse scientific data across disciplines. At the moment the following initiatives build the core of the German GO-FAIR node. These are RADAR – Research Data Repositorium headed by FIZ Karlsruhe – Leibniz Institute for Information Infrastructure, the project Generic Research Data Infrastructure (GeRDI) lead by ZBW – Leibniz Information Centre for Economics and the Excellence Cluster Future Ocean of Kiel University. GO-FAIR could help to build an EOSC that is accepted in the Member States as it is a Member States-Up strategy. To do so close cooperation with the Open Science Policy Platform and the OSPP’s Working Groups will be of utmost importance. While the OSPP should be responsible for the expert policy level input to the Commission on how to further develop and practically implement Open Science policy as a dynamic, stakeholder-driven mechanism for bringing up and addressing issues of concern for the European science and research community and its representative organisations, the GO-FAIR initiative should underpin these efforts through a conglomerate of executive instances that deliver on the actual pillars of implementation. In addition, close cooperation with the different activities in other regions (such as the NIH Commons) will have mutual benefits for all and will help to build an Internet of FAIR Data and Services.